A cat that disappeared in 2013 from South Carolina turned up nearly 2,300 miles away in Riverside County after hitching a ride in a U-Haul trailer. THOUSAND PALMS, Calif. -- A cat that disappeared in 2013 from South Carolina turned up nearly 2,300 miles away in Riverside County, California after hitching a ride in a U-Haul trailer. Like most lost pets at the shelter, Kevin the cat is waiting to go home. But for Kevin, home isn't exactly close-by. His owner, Cheryl Walls, said the orange tabby would always hang out in the front yard of her home in Anderson, South Carolina, until he vanished about a year and a half ago. "He was fine, and we went to call him, and he wouldn't come," Walls said. What exactly happened to Kevin is unclear. Somehow, he made his way 500 miles south to Florida. There, he wound up inside a U-Haul trailer, headed for California. About five days later, a state agricultural inspector in Blythe was doing a routine check on the trailer, when she heard meowing coming from inside. "From my understanding, they opened up the U-Haul, and there he was," Walls said. Kevin was dehydrated but otherwise OK. All it took was one scan of the microchip to find his owner. "It was a very huge surprise," Walls said. Kevin boarded a plane Wednesday at Palm Springs International Airport. 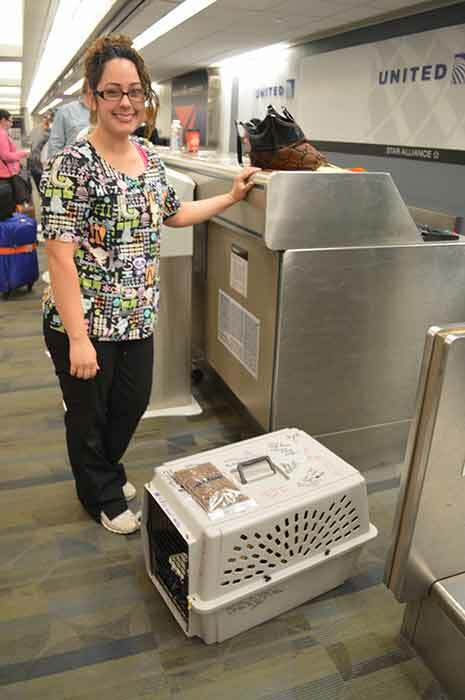 Animal shelter worker Emily Huffman drops off Kevin the cat at Palm Springs International Airport on Wednesday, March 18, 2015. Shelter officials say some staff members and pet rescue foundations helped fund Kevin's trip back to South Carolina to be reunited with his owner.